Rocky and Bullwinkle have had a cult following since the 1960’s, falling into lean times until a big-screen movie treatment brought a modest revival of sorts. Geico has occasionally honored classic ‘toon heroes in their commercials, including the great Wile E. Coyote. While neither Rocky nor Bullwinkle can aspire to the lofty title of genius rightfully bestowed on the Coyote, it’s still good to see them occasionally getting out and about in public. This was the case in a recent Geico commercial where we first see the omnipresent Gecko in the Rocky Mountains, reflecting on the enduring qualities of both the Rockies and his insurance company employer. – – I suppose that I shouldn’t be surprised that a movie is being made of Mr. Peabody & Sherman, since movies and sequels have been made of The Smurfs and The Chipmunks. If there’s a chance that parents are familiar with the original subject, a movie treatment serves to introduce children to the character, and film makers hope that a profitable franchise is born. Now The Rocky and Bullwinkle Show was a gem in the 1960’s, and has already been subjected to a movie treatment. Besides introducing us to Rocket J. Squirrel and Bullwinkle Moose, the Rocky and Bullwinkle Show had other unrelated ‘toon features that included Dudley Do-Right and Peabody’s Improbable History segments. Mr. Peabody was a talking, bespectacled, intellectual white dog who in a role reversal had an adopted boy, Sherman. Through use of a time machine, Peabody and Sherman would travel back in time in episodes to encounter memorable historical figures, teaching Sherman of their significance and at times benevolently influencing the turn of events. …a second tier yet memorable Warner Bros. character, Pepe was a stereotypic Frenchman in the same manner that Speedy Gonzalez was a stereotypic Mexican. 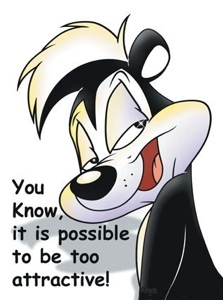 Pepe would perpetually stroll about Paris in the spring, foisting his totally unwelcome romantic attentions upon an unfortunate black feline, Penelope Pussycat, whom Pepe would always mistake to be a female skunk. Penelope’s resemblance to a skunk was often generated by some plot device such as the cat crawling under a freshly painted white fence, and emerging with a white stripe down her back; Pepe was readily deceived, perhaps because of his own eagerness. Much of the ensuing cartoon antics would then center about Pepe’s persistent pursuit of the misperceived female, and her frantic efforts to escape his amorous intentions. – – ‘Toon bears are less common and often forgettable, so I’m glad to find something different. Both Brickleberry and Yogi Bear are set in fictitious national parks, and include the relationships between bears and park rangers, but the resemblance ends there! The Comedy Channel show Brickleberry is anything but clean and wholesome, and the center of focus for me is an anthropomorphic grizzly bear cub named Malloy who is crude, politically incorrect, narcissistic, has a superiority complex, and delights in putting down and messing with the park rangers, none of whom are normal individuals! His parents unintentionally slain, Malloy has been raised by humans, and excessive indulgence in video games and junk food have turned him into something dark and sardonic that nature never intended; this is Baby Stewie from Family Guy in a fursuit! Yogi Bear and Boo-Boo wouldn’t last five minutes with him, and Brickleberry is anything but Jellystone Park! In addition to being likened to Family Guy, the show has also been compared to South Park in terms of trying to be offensive and pushing the boundaries, with violent and sexual content making this not a show for the kiddies…but what a bear we have in Malloy!